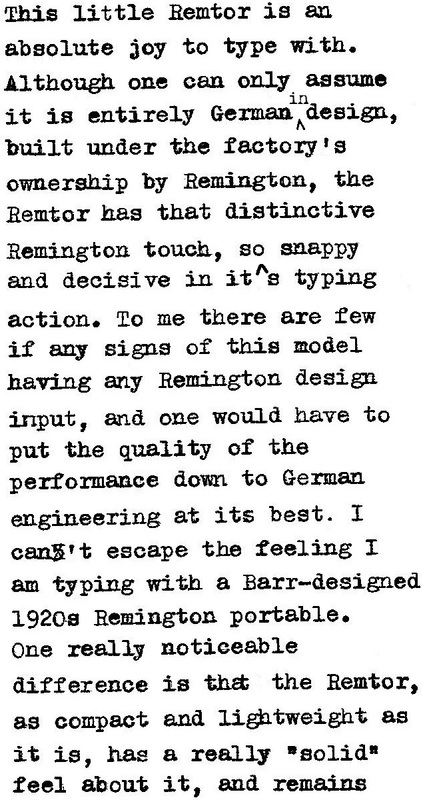 Having been an avid reader of Richard Polt's The Classic Typewriter Page for many years now, and as someone who has had call to refer to his Remington Portables page many hundreds of times, I was fortune enough to instantly recognise the brand name Remtor when it bobbed up. As soon as I saw the portable typewriter listed, I realised it was the same model as one I had coveted for a very long time: the Deutsche Remington which can be seen on Alan Seaver's site, Machines of Loving Grace. The distinctive high collar in front of the typebasket was unmistakeable. The Remtor gets its name from a combination of the brands Remington and Torpedo. Remington Rand took over Torpedo’s typewriter arm in 1932. 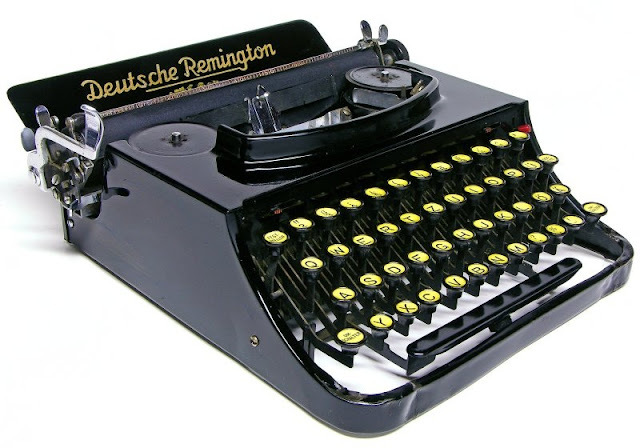 The new corporate name became Remington Buromaschinen GmbH, but the company continued to market the majority of its typewriters as Torpedos. 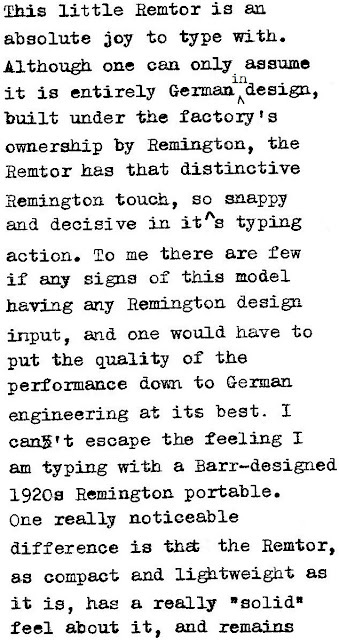 As Richard Polt points out, "This [the Deutsche Remington-Remtor] is not a true Remington design." Indeed, judging by Ernst Martin's 1949 Die Schreibmaschine und ihre Entwicklungsgeschichte, it is either the Torpedo Model 15a or the Model 17. Illustrations in Martin's book indicate it is the Model 17, which Martin calls the Deutsche Remington Junior. In his entry on Torpedo, Martin writes, "[The Torpedo] Models 12 and 14 were sold in England briefly as [the] Unitype and later [the] Mead portable. [The Torpedo] Blue Bird and the Deutsche Remington are identical with the [Torpedo] Model 15a and the Deutsche Remington Junior with the Model 17. 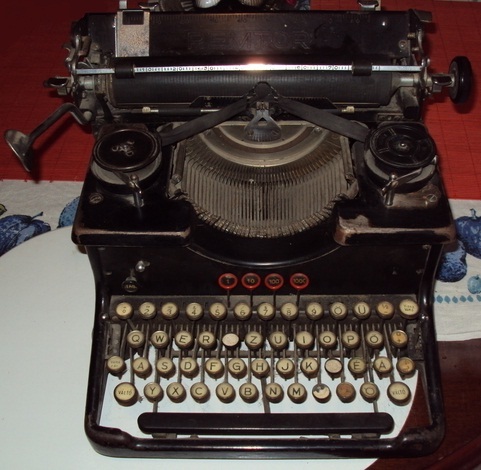 [The] Lautios Torpedo (1934) is otherwise described as a Remington-Rand machine. [The] Remtor was another Torpedo model." My Remtor has the serial number 335281 stamped on the back. Alan Seaver's Deutsche Remington has the serial number 175085, and Alan dates it from 1933. Alan says the 1933 Model 17 was the first new product of the Remington-Torpedo merger, and was manufactured in Torpedo's Frankfurt factory. Bearing in mind the confusion created by Martin's book, Alan adds, "The Typewriter Serial Number Database insists that the serial number belongs to the Model 15's sequence, but the design and all available documentation indicates that this is a rebadged Model 17." I heartily agree with Alan on this. OK, but was there ever a Remtor company? It seems the easiest place to find a Remtor these days is in Hungary, where, to the best of my knowledge, there never was a typewriter industry. But in 1939, the year my Remtor was made, Remtor Typewriter Ltd had its base at 12 Andrássy út, an iconic boulevard in Budapest. (The offices are now the occupied, partly, by Euroscript Hungary). On the front of my Remtor are the words, "MAGYARORSZÁGI VEZÉRKÉPVISELET IRÓGÉP KF. TÁRSASÁG BUDAPEST", with the brand name Remtor in the centre of this line. Magyarországi is Hungary, vezérképviselet means representatives or agents, irógép is typewriter and KF. T stands for Korlátolt Felelõsségû Társaság (limited liability corporation). 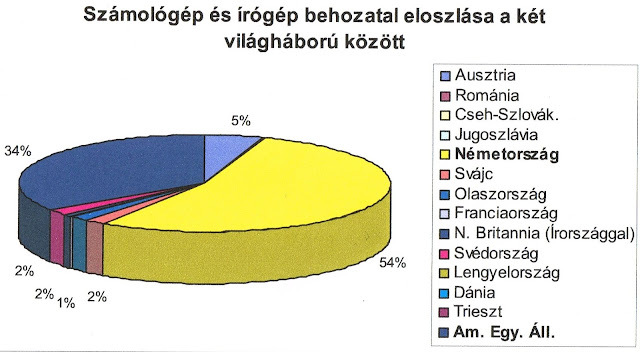 Hungarian imports of typewriters and calculators between the world wars. More than half came from Germany. There isn't anything worse than a typewriter that moves around when you're typing. I'd never heard of a Remtor before. It sounded fake when I read the blog title. Looks like a great machine though! Thank you Jason and Richard. I would thoroughly recommend getting one of these, they are lovely machines to type on. I actually bought this to help me fill the gaps in the upcoming Good Companion story. You might have noticed Ernst Martin's reference to the Mead (Torpedo 12-14), as well as the Unitype. I'm still very keen to get a Klein Torpedo with the rounded top, like yours. The Mead is the same as Richard Amery's Regent. It's the colon that's missing, isn't it? These typewriters Hungarian keyboard! Hungarian special characters: á,é,ö,ő,ü. Would love to discover in which Hungarian City my 1976 Hermes 3000 was made, but haven't had any luck. Perhaps Budapest, given this earlier history? By its serial number it should be a Torpedo Model 5b. But i havent seen any picture of it yet. The last picture in this post shows a one that is similar in almost every aspect but its Remtor logo is a little bit different. The Hermes Swiss and Hungarian IGV (IrodaGépipari és finommechanikai Vállalat) made in cooperation bag typewriter in the seventies and eighties known piece. Home has been on the market 1970 end of year (1975-80). IGV produced: Cash register, clerkly products. This website created by my typewriter collector friend. I recently got a standard sized Remtor like in the last photo. I wonder where I might find a manual or model number.